If you own your own business, you are likely more than aware that perception is everything. This means that you need to be concerned with what people see when they look at anything that is associated with your company. Whether it be your website, your logo, or the commercial space where your business is housed, people are going to make assumptions based on what they see. This can be a good or a bad thing depending on the current state of your business and while you may not be able to completely redo your site or your logo in a short amount of time, image-boosting services like commercial pressure washing can make one huge difference when it comes to how your business’ location is considered by customers. Improving your image isn’t the only thing that a professional power washing can do for your business, however. Learn what other things you can gain when you have the exterior of your commercial space cleaned by reading below. When a building is clean, both on the inside and the outside, it shows that you take pride in your company. Plain and simple, customers are more likely to put their trust in your business if it looks as though you take care of your space. When you hire a company to regularly pressure wash your business, it shows a level of caring that otherwise may not be communicated to your customers. This will lead to them being much more likely to purchase your services and/or products. Not having your building pressure washed regularly is sure to lead to it becoming covered in everything from dirt to graffiti, to grime. This will eventually lead to your building beginning to rot. If you don’t want to have to worry about having to move buildings anytime in the near future, it’s important that you make sure that the exterior of your commercial space is taken care of. 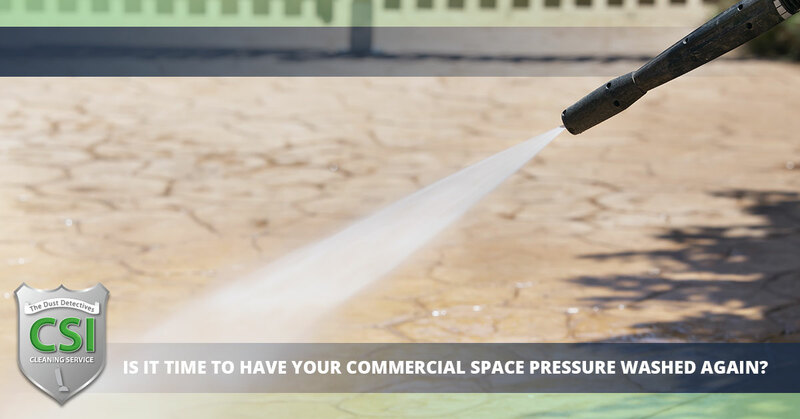 The more often you have professionals perform commercial pressure washing on your building, the longer it will last and the easier it will be to remove grime. Larger commercial spaces tend to pick up a lot of pollution over time. This can be from things like car exhaust or other environmental factors. These are the things that can contribute to your building looking as though it is dirtier than it actually is. With professional power washing, eco-friendly products will be used so that the exhaust and additional pollutants can be washed away from both your building and your parking lot. Coming into work every day just to see a building that is covered in dirt and grime is not something anyone really wants to endure. You want your employees to look forward to coming to work and a filthy work environment won’t make that happen. By having your building’s exterior cleaned, you can ensure that those who come there every day are happy with the conditions of the workplace. Want to hire CSI Cleaning to Pressure Wash Your Building? We know that the last thing you want to do is skimp on your commercial business space. Especially when it comes to how it looks. If you want to improve your business’ appearance, your customer interest and your employees’ feelings about coming to work, it’s time to hire CSI Cleaning Service in Vineland today! We have been serving this area for long enough to know precisely what you need. Get the very best in price and pressure washing services when you use our expert team! Contact us now for a quote!